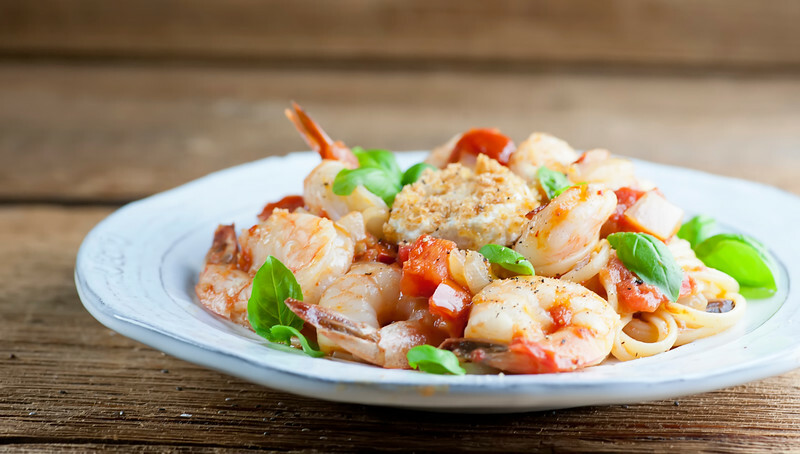 Get your hands on some of the best goat cheese you can find and make this easy and delicious recipe for shrimp, tomato and basil linguine with goat cheese rounds! Simple little toasted goat cheese rounds take this pasta recipe from regular to elegant in two shakes of a goat’s tail. Okay, here’s the best thing about this recipe for shrimp, tomato and basil linguine with goat cheese rounds. See that circle of cheese right above the shrimp? The one with the brown crunchy edge? That, my friends, is a warm, crunchy on the outside, creamy on the inside, little circle of goat cheese that has been dusted in bread crumbs, baked in the oven just until it is soft and wonderful, and then tucked into the middle of this pasta dish. So when you cut into it it falls apart easily and bits of warm goat cheese get all tangled up in the pasta as you twirl it around your fork….I got lost in a pasta dream for a second. Ready for some goat cheese deliciousness? Let’s make it! I mean, tell me they aren’t smiling for the camera? AND THOSE EARS. 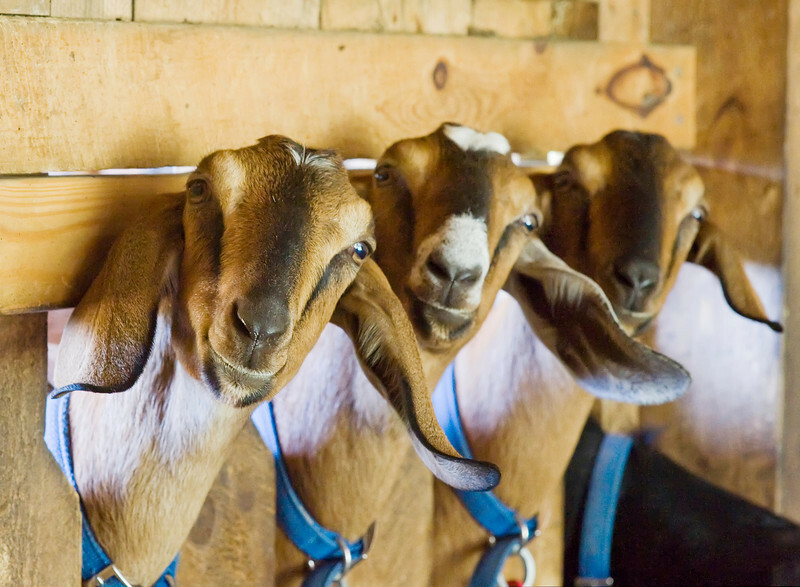 These goats live at Hildene in Manchester, Vermont, and they make the best goat cheese I’ve ever had. And if you can’t make it to Hildene to pick some up, see if you can find goat cheese from Vermont Creamery – theirs is scrumptious too. 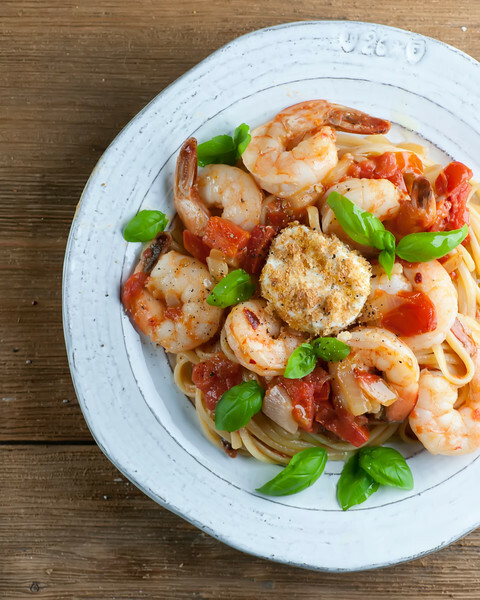 Get some goat cheese and make this easy and delicious recipe for shrimp, tomato and basil linguine with goat cheese rounds! Simple little goat cheese rounds take this pasta recipe from regular to elegant. #recipeClick to TweetAnyway, this is a lovely, quick dinner that is great for both a weekend night or a special dinner for friends and family. The sauce is a speedy one made with fresh tomatoes, onion, and shrimp. The goat cheese rounds cook up in a snap in your oven. All you have left to do then is cook up some linguine, toss it with the sauce and some fresh basil, pop a warm goat cheese round on each one, and there you have it. Pulse bread in food processor to fine crumbs. Spread on baking sheet and bake until golden, about 10 minutes. Transfer to plate and let cool. Cook linguine according to package directions. Scoop out a cup of pasta water before you drain it, then drain and set aside. Slice goat cheese into 4 rounds. Press each round into crumbs until coated. Bake at 400 for 10 minutes. Meanwhile, heat oil in skillet over medium heat. Add onion and saute for 5 minutes. Stir in tomato, wine and pepper and cook 15 minutes, stirring occasionally. Add shrimp and salt, cook 4 more minutes or until shrimp are done. Add cooked pasta and basil to tomato sauce and toss to combine. Divide pasta mixture among plates, top each with a goat cheese round and serve! Updated and improved from a previous Framed Cooks post! This recipe sound absolutely delicious! Too bad I can't eat shrimp…maybe I will try substituting some artificial crabmeat instead. Of course, the goat cheese and the basil is enough for me so I would eat it without anyhthing added at all! OH yeah this is totally calling my name! I had a warm goat cheese round like this on a salad over the summer. Amazing! questo piatto è davvero invitante! Such awfully cute goats….clearly good material, very good photographer eye…looking forward to the recipe. Looks perfect! This sounds like the perfect meal to serve friends this weekend…thank you so much for sharing.